Visitors to a new exhibition at Cooper Hewitt, the Smithsonian Design Museum in New York City, can walk beneath a shimmering, seven-foot-high knitted textile pavilion designed by Jenny E. Sabin, Cornell’s Arthur L. and Isabel B. Wiesenberger Assistant Professor of Architecture. The multicolored structure, made from photo-luminescent and solar-active threads, is one of two works commissioned by the museum for “Beauty – Cooper Hewitt Design Triennial,” which opened Feb. 12 and includes more than 250 projects by 63 designers and teams from around the globe. Lipps said the museum decided to commission a textile pavilion by Sabin because of her pioneering work using emerging technologies in architecture. In addition to her PolyThread pavilion, the exhibition includes a glass display case with several 3D-printed ceramic PolyBricks and other objects designed by Sabin. “We have been really attracted to her work because she’s proposing new ways of thinking about architecture,” Lipps said. “She’s doing some very interesting work that fuses digital trajectories with biological and material sciences." 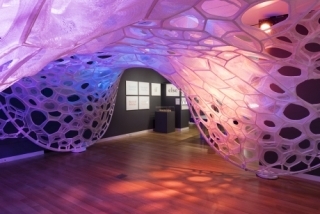 “Beauty,” open through Aug. 21 at Cooper Hewitt, 2 E. 91st St., Manhattan, is the museum’s fifth triennial exploring contemporary design from the perspective of aesthetic innovation, in projects ranging from fashion ensembles to furniture. Sabin’s 400-square-foot PolyThread pavilion is the largest work in the exhibition, taking up half of a third-floor gallery. Covered with a maze of variegated cellular shapes, the pavilion’s 15-minute illumination sequence mimics the transition from day to night, changing from pale blue to white. The structure is Sabin’s second textile pavilion commissioned for installation in New York City. The first was designed for the release of Nike’s Flyknit Collection in 2012. As part of her research on the intersection of textiles and architecture, Sabin views PolyThread as a prototype for applications of fabric-based structures. “I can see this as a permanent large outdoor pavilion or structure that could operate well in a park or an outdoor environment,” she said. The process to create PolyThread took 10 months to complete. Sabin collaborated at the Sabin Design Lab on campus with Charles Cupples, M.Arch ’15, and Martin Miller, a former visiting critic at AAP. The international engineering firm ARUP tested the integrity of the structure and Shima Seiki U.S.A., which makes computerized knitting machines, created the material. Sabin installed the pavilion at Cooper Hewitt the first week of February, along with Cupples and students Max Vanatta, B.Arch. ’16, and Andrew Moorman, B.Arch. ’17. Sherrie Negrea is a freelance writer for the College of Architecture, Art and Planning.